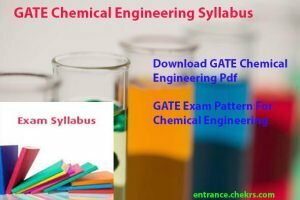 GATE 2019 Syllabus for Chemical Engineering Pdf is now available through which aspirants can start preparing well for the GATE 2019. Aspirants who want to pursue M.Tech courses in Chemical Engineering in the reputed institutes across the country must go through GATE 2019 Chemical Engineering Syllabus and get a precise idea about the examination. Applicants can also download GATE Syllabus for Chemical Engineering pdf and make their study plan as per the syllabus. Apart from the syllabus, you can also check details of GATE Exam Pattern For Chemical Engineering. Candidates who are preparing currently for GATE Chemical Engineering Exam must adopt the method of practicing GATE Chemical Engineering Syllabus and accordingly make their study plan. After going through syllabus applicants can get proper idea about the possibility of important questions which are asked in the examination and get to know more about the GATE Syllabus and Weightage. GATE (Graduate Aptitude Test) is on of the important examination for pursuing Master Degree Courses.The examination is not tough if your preparation is sound. Likewise, aspirants of GATE must have the precise information of GATE Syllabus, old question papers and exam pattern. We have enclosed here GATE CH Syllabus, for the practice purpose of the applicants. For the better mode of preparation, applicants can also download GATE Syllabus For Chemical Engineering through the link provided below. Aspirants can follow the process of GATE Syllabus fFor Chemical Engineering Pdf Download and get the complete information about the examination. For more updates keep visiting our portal.